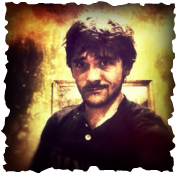 Alex is the founder/site designer of Ajazz Networks as well as the web shows Ajazz Tech, Ajazz Encrypted, The Daily Decrypter, The Tech Portal and one of the creative minds behind The Salinor Show. He has been podcasting with co-founder Kyle Cicilioni since 2007. He is an artist for his comics blog Crappy Comics and writes just about anything on Ajazz Decrypted. He is currently working in NYC as an Assistant Video Editor for Engel Entertainment on Animal Planet's North Woods Law and works for Music Choice as a videographer. He also dabbles in advertising as a product photographer and web producer for both wholesale and retail businesses. Alex has experience working as visual effects coordinator on the independent feature "Ripped!" and was an additional production assistant on the film Unstoppable (Tony Scott, 2010). He has worked with ScriptESystems.com redesigning their website and directing/editing their tutorial videos for their ScritpE app and DH Costume app. Alex is the writer/director of the short film Anthony and the Devil, which won first place at the Endless Mountains Digital Film Festival and was exhibited as an educational piece for Penn State University. Prior to pursuing a career in film/television, Alex worked for eleven years as a Mobile DJ. Kyle is the co-founder of Ajazz Networks as well as the creator/editor of R.A.N.T., host of Cinema Clash, co-host of Ajazz Encrypted, and one of the creatives mind behind The Salinor Show. He has been podcasting along side Ajazz-entrepreneur Alex Zarnoski since 2007. Kyle has an immense passion for film that sometimes makes him synical, but insightful nonetheless. Maybe it's because of his false sense of superiority due to the award he won for a film he made back in high school, but we shall never know. With a degree in broadcast media, Kyle currently is a director at a local news station. His favorite TV shows include Arrested Development, Aqua Teen Hunger Force, Home Movies, and Breaking Bad. He loves pomegranates and executing headshots in Counter Strike.